I guess the nesting urge has kicked into full-gear. 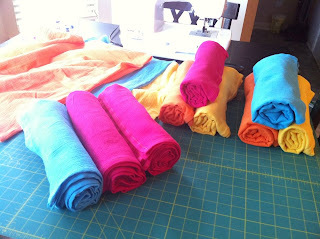 I went on a sewing spree this morning and finished the remaining 8 (out of 12) gauze baby blankets that I had planned to knock out. Holding back 3 for the baby on the way and ended up listing the rest in my shop. At one point, my table was COVERED in swaddling blankets! Once they were complete, I wrapped them up to take pictures for listing them in the shop.